In Act III, scene 1, Viletta, the avaricious maid to Rosaria, fends off Trappanti, who has just tried to kiss her. Trappanti tosses her a purse, and she changes her mind, "Well, if I must, come then - to see how a woman may be deceived at first sight of a man." The engraving carries the line: "Indeed my friend, you are too ugly for me; tho' I am not handsome myself, I love to play with those that are." Viletta is rather grandly dressed for a lady's maid in the costume of the 1780s. She wears a large straw hat with white satin ribbons and ostrich feathers. Her dress has a white silk bodice and sleeves with purple-black puffs at the elbows, and zigzag bands of decoration round the low-cut neck and at the waist. The full skirt is also of purple-black, gathered into two rows of white bows and has a white zigzag decoration round the hem. She stands in a listening attitude beside a half-open door. Cibber's comedy was originally performed at Drury Lane on 26 November 1702, with the author as Don Manuel and Mrs Knight as Viletta. 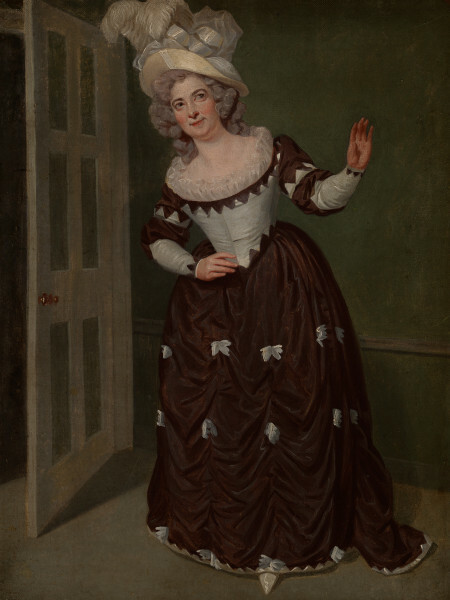 Mrs Rock never played Viletta in London; she appeared in the play once, at Covent Garden on 16 July 1790, when she acted Rosa and Mrs Lee Lewes played Viletta.